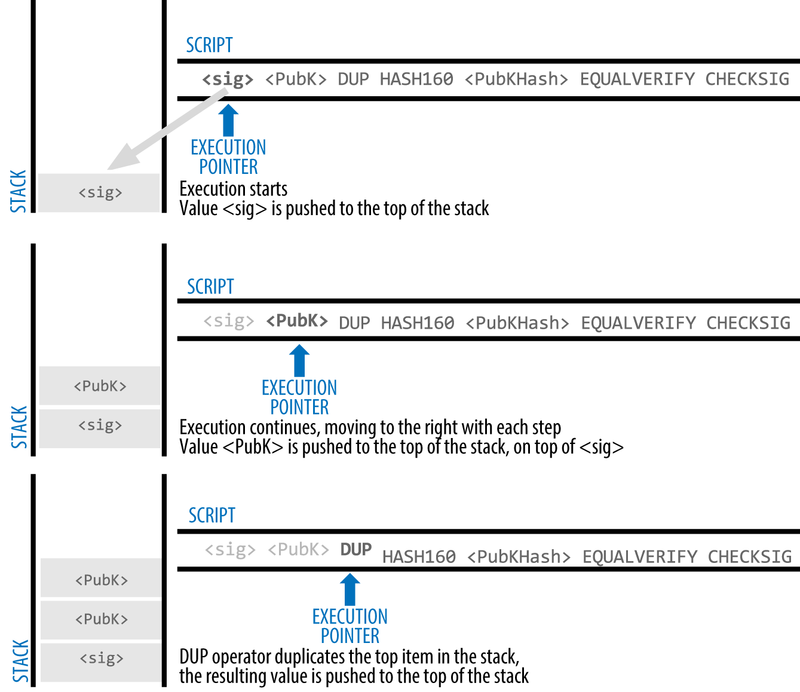 In part 1, I went in to details about transaction inputs and outputs, as well as how the locking and unlocking scripts are executed by the stack-based execution language ‘Script’. In part 2, I will mention the different types of bitcoin transaction scripts in use today and how they operate. It is Turing Incomplete, meaning that it has no loops or complex flow control capabilities. This limitation is intentional in order for scripts to have limited complexity with predictable execution times. It is Stateless, in that there is no state prior to the execution of the script or any state saved post execution. The book mentions that there are 5 types of transactions that could be processed by a bitcoin node. However, this may not be the case now. And now Bob can reference this UTXO and provide his unlocking script to spend this output…Very nice! This transaction type uses a simpler script and uses the public key instead of the hash. Pay-to-Public-Key-Hash (P2PKH) is favoured over this transaction type. This is a special script where you have N public keys and you need M signatures to release the encumbrance. 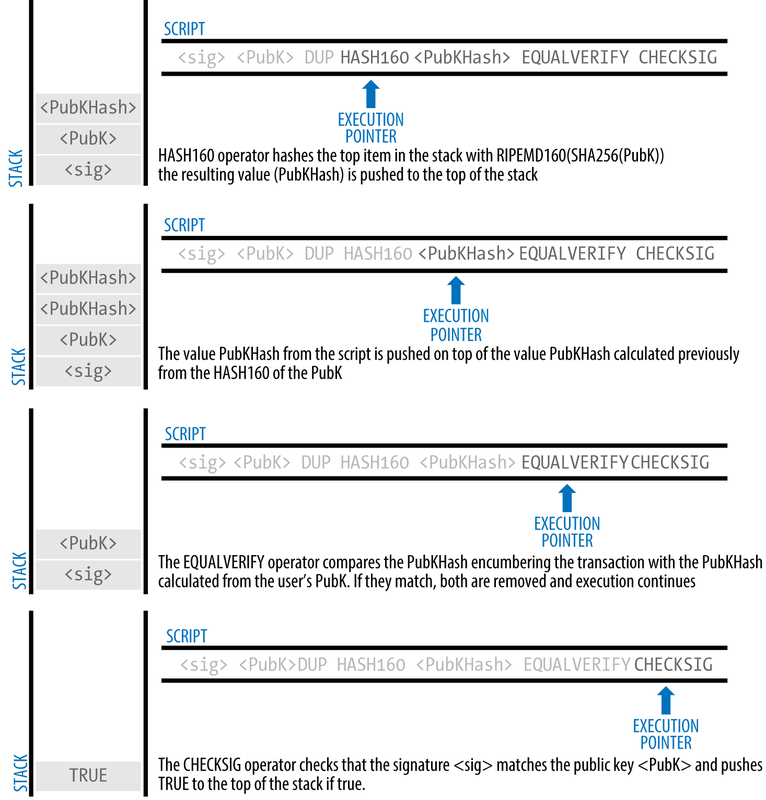 Therefore, a UTXO can be spent if M signatures are presented in the unlocking script out of the N public keys in the locking script. In the above, 2 signatures are presented in the unlocking script. If M = 2 and N = 3, this means that the locking script requires 2 out 0f the 3 signatures (derived from private keys) that correspond to the 3 public keys to validate the transaction. Bitcoin has potential uses beyond payments. This transaction type allows for using the blockchain to store data unrelated to bitcoin payments. This is achieved though the OP_RETURN operator. OP_RETURN outputs are recorded on the blockchain and are provably unspendable. For example, it can be used to store a digital fingerprint of a file to establish proof-of-existence of that file on a particular date. The data portion is limited to 80 bytes and most often represents a hash, such as the output of a SHA256 hashing algorithm (32 bytes). Some applications also use an 8 byte prefix to help identify the application. It is important to note that there is no “unlocking script” here as OP_RETURN outputs are unspendable. If I were to make a payment using this script, my bitcoin wallet application would need to have the ability to create custom transaction scripts. This introduces a barrier to payment. Moreover, due to the large size of the script, this would increase the transaction fees required to process the transaction. Remember, transaction fees are calculated based on the size of the transaction in kilobytes (not the value of BTC!). This also unfairly puts the burden of transaction fees on the payer and not the payee who requires this script. In a P2SH transaction, the payer would just need to use a special bitcoin address which are essentially Base58Check encodings of the 20 byte hash of the redeem script. Therefore, this address would correspond to a script instead of a public key. There is no need to support a custom transaction script in the bitcoin wallet application. 1- No support required for custom transaction scripts. Scripts can be coded as a bitcoin address. 2- Smaller transaction size for the sender (meaning less transaction fees). Burden is shifted to the recipient. This concludes the topic of bitcoin transactions! I will have more on other areas of bitcoin. I live and breathe technology. Curious about programming, cryptocurrencies and cybersecurity.